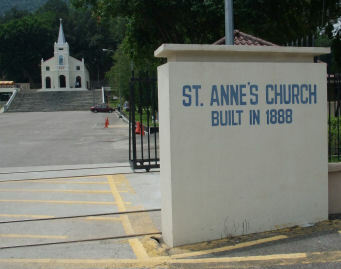 St Anne's Church, Bukit Mertajam is a famous Roman Catholic church located in Bukit Mertajam on the mainland of Penang. The church attracts many people during the feast of Saint Anne. 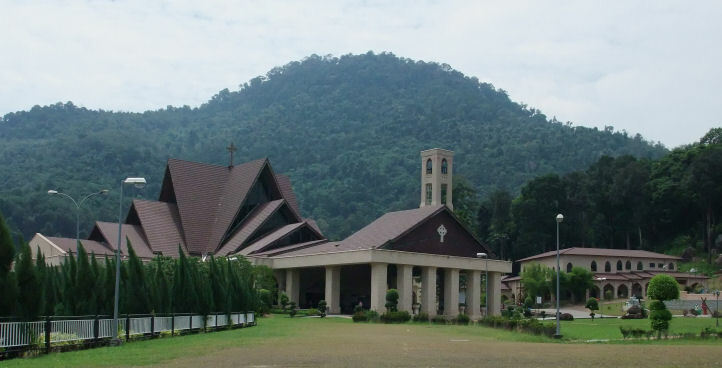 It is one of the parishes in the Diocese of Penang. 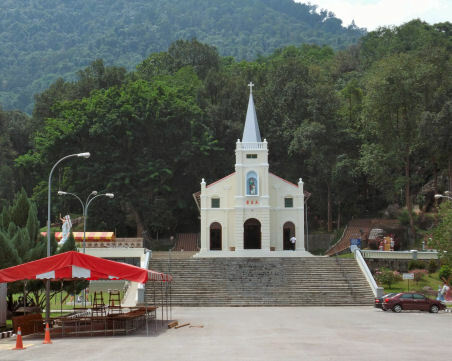 The St. Anne Church of Bukit Mertajam can trace its beginning to 1833, when Chinese and Indian Catholics from settled in the foothills of Bukit Mertajam. 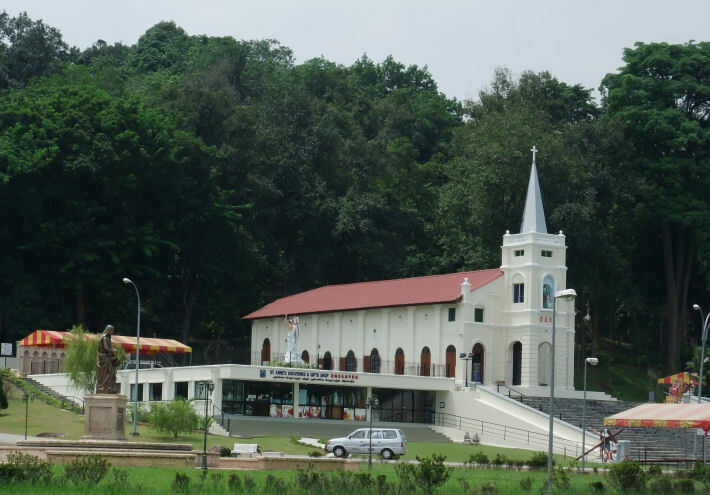 The very first Catholic church in Bukit Mertajam, a small chapel, was built on top of the hill. The chapel was founded in 1846 by French priests. It is named after St Anne, the mother of the Virgin Mary and grandmother of Jesus Christ. Catholics observe her feast day on 26 July every year. St. Anne is believed to have been born around 50BC in either Nazareth or Bethlehem. She is the patroness of cabinet makers and miners, as well as those engaged in the craft of spinning, weaving, embroidery, sewing and other such skills. The very first church, a small chapel, is today the 15th and final station of the Cross which devotees make in their pilgrimage. As the congregation grew, another bigger chapel was built in 1865. The site of this second chapel is just behind the wall of taps of Saint Anne's water. The spring water is naturally filtered by the soil and is cleaner than tap water. The iconic Old Church was built in 1888, under the leadership of Fr. F.P. Sorin. He died in 1907, right on the day of the St. Anne Feast, and was buried at the entrance to the Old Church. This "Old Church", now called the "Shrine of St Anne", is the main focus of the Feast of St Anne every year. It dates back to 1888. The beautiful stained glass above the altar dates to 1896. As the Feast of St Anne received increasing numbers of followers, it soon became necessary to construct a new church complex. The new church complex was begun in May 2000, and was dedicated on the St Anne's Feast Day of 26 July, 2002. This new church blends Minangkabau roof design with Gothic architecture to create one of the most imposing structures in Penang. The spacious interior has a seating capacity of 1800. The St. Anne Feast of Bukit Mertajam is one of the 20 biggest Catholic pilgrimages in the world, drawing about 40,000 to 60,000 devotees each year. At the annual feast, the 188 year old church play host to pilgrims comprises Catholics and also non Christians praying for health and blessings. Many who came here fulfilled their vows by lighting candles, offering flowers and attending mass and novenas. It is such a wonderful event filled with excitement and joy that showcase the unity of people from every part of the world. Pilgrims bathed in a sparkling sea of light took part in a candlelight procession. They came from not only from Malaysia but from Thailand, Singapore, Philippines, Myanmar, Sri Lanka, India, Australia, New Zealand and even from as far away as Europe. This marks the important day for pilgrims to the thank her for countless prayers answers and petitions granted.